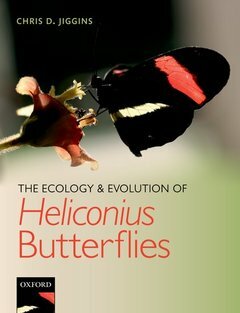 The Ecology and Evolution of Heliconius Butterflies Jiggins Chris D.
Auteur : Jiggins Chris D.
The Heliconius butterflies are one of the classic systems in evolutionary biology and have contributed hugely to our understanding of evolution over the last 150 years. Their dramatic radiation and remarkable mimicry has fascinated biologists since the days of Bates, Wallace, and Darwin. The Ecology and Evolution of Heliconius Butterflies is the first thorough and accessible treatment of the ecology, genetics, and behaviour of these butterflies, exploring how they offer remarkable insights into tropical biodiversity. The book starts by outlining some of the evolutionary questions that Heliconius research has helped to address, then moves on to an overview of the butterflies themselves and their ecology and behaviour before focussing on wing pattern evolution, and finally, speciation. Richly illustrated with 32 colour plates, this book makes the extensive scientific literature on Heliconius butterflies accessible to a wide audience of professional ecologists, evolutionary biologists, entomologists, and amateur collectors. Chris Jiggins is Professor of Evolutionary Biology at the Department of Zoology, University of Cambridge, Director of Studies and Fellow at St John's College, Research Associate at the Smithsonian Tropical Research Institute, and Fellow of the Royal Entomological Society. His research group is currently working on many aspects of Heliconius evolutionary biology, including evolutionary developmental biology of wing patterning, the genetic and behavioural basis for speciation, the sensory ecology of mimicry and analysis of the Heliconius melpomene genome.